Carbon emissions are one of the big concerns impacting climate change, with projects from the development of carbon dioxide-scrubbing plants to businesses pledging to offset their carbon emissions being suggested as ways to reduce our carbon footprint. Now scientists from South Korea have come up with a breakthrough concept which can turn carbon emissions into usable energy. 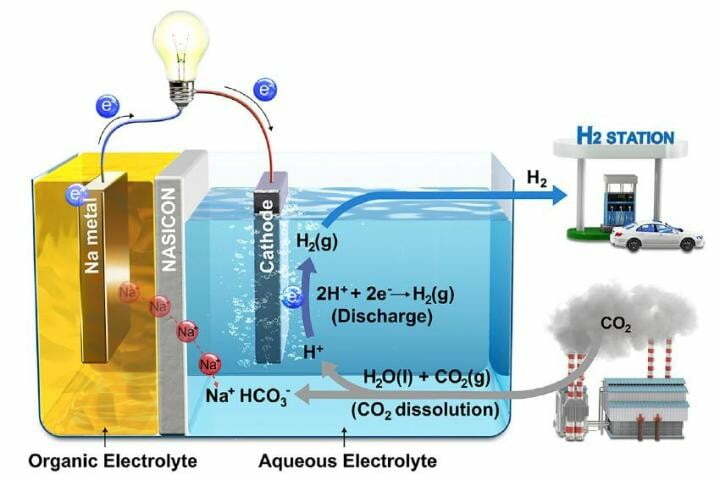 Scientists from the Ulsan National Institute of Science and Technology (UNIST) developed a system which can continuously produce electrical energy and hydrogen by dissolving carbon dioxide in an aqueous solution. The inspiration came from the fact that much of the carbon dioxide produced by humans is absorbed by the oceans, where it raises the level of acidity in the water. Researchers used this concept to “melt” carbon dioxide in water in order to induce an electrochemical reaction. When acidity rises, the number of protons increases, and these protons attract electrons at a high rate. This can be used to create a battery system where electricity is produced by removing carbon dioxide.